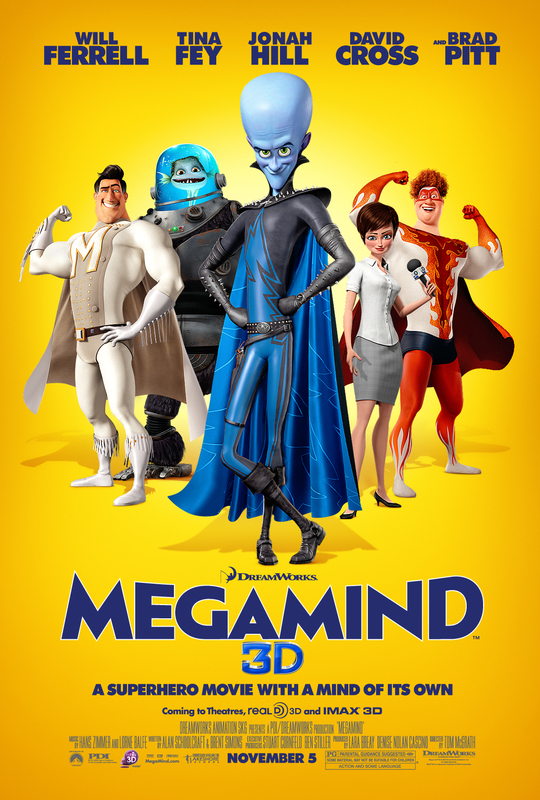 Super-villain Megamind (Will Ferrell) has one goal in life – to destroy his archenemy Metro Man (Brad Pitt). But after accidentally succeeding he discovers that life is empty and sets out to create a new superhero in the visage Tighten (Jonah Hill). It’s a great plan until Tighten becomes drunk with power and turns out to be a far greater villain than Megamind ever dreamed of being. The animated film will undoubtedly draw comparisons to Despicable Me and it will pale in comparison. 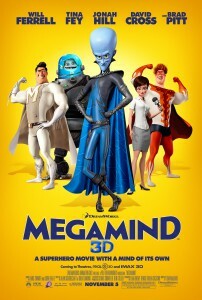 Megamind is similar to that films anti-hero. While both are villains, neither is truly menacing. In both cases the audience quickly discerns that they just want attention. However, where Despicable Me went for charming Megamind wants to be non-stop-laughs and action. Sadly, even with the talents of Ferrel, Hill, David Cross and Tina Fey, the laughs never quite happen. Clearly the improvisational skills are in place but since animated films have their stars record their voice work separately they never really get a chance to build off of each other. There’s a solid line here or there but the level humor expect from a cast of that caliber never materializes. Additionally, DreamWorks continues their history of painfully obvious music cues. Want to show that Megamind is bad to bone? How about George Thorogood’s “Bad to the Bone”. What’s that? Our blue-hued super-villain is lost without his nemesis? Might I recommend Gilbert O’Sullivan’s “Alone Again Naturally”? The good guys have lost and the bad guys are running amok throughout the city? Hmmm…that’s a tough one. AC/DC’s “Highway to Hell”. Oh, wait…Ozzy Osbourne’s “Crazy Train”. You know what, we’re Dreamworks. We have the money. Screw it. Let’s do both! In all fairness, Megamind isn’t a bad movie just a derivative one. The story has so many plot points to hit that it gets weighed down by its own exposition. The final third of the movie picks up considerably when the action scenes kick in full force. But the film seems more interested in being a tale of love and redemption and those action scenes, effective though they may be, feel like an afterthought. On a scale of 1 to 10, with 10 being Despicable Me and 1 being Planet 51, Megamind gets a 6.